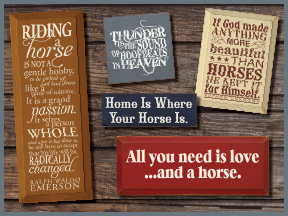 We have a stable-full of horse signs in a variety of sizes! Our solid pine rustic signs fit perfectly with country decor! We have funny horse signs, plus sentimental horse signs, and great horse quotes! With over 40 colors to choose from, your solid wood sign from Sawdust City will look great anywhere! Horses are like potato chips...you can never have just one.